REMCO Offers A New Vision For Money Transfer. REMCO Tokens (REMCO Remittance tokens) connect senders and recipients without any intermediary, the way mobile phones connect two people. REMCO Remittance tokens use a revolutionary programmable money transmission token and APIs allow remittance companies globally to mint and customize their own Tokens. 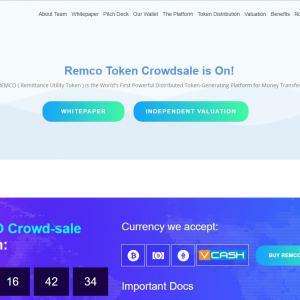 REMCO blockchain solution is a Tokenized money transfer platform with unparalleled speed, designed for licensed money transmitters. REMCO's technology platform provides money transmitters, agents and customers a proven "out-of-the" box ledger solution to move money at the speed of thought. It's a Powerful Distributed Token-Generating Platform for Money Transfer. The REMCO Token Generating Platform’s APIs to allow any licensed money transmitter to mint programmable Tokens to move value and leverage distributed ledger advantages at speed and scale, while also offering innovative compensation to all transaction stakeholders. Our Token is Jurisdiction and Money Transmission Flow Agnostic. Meaning it works with the existing model. The parent company has Money transmitter and mobile payment licenses and has processed billions in transactions with millions of subscribers. The parent company has many jurisdictional money transmitter licenses in the USA and CBN licenses for mobile payment and international money transfers. These businesses will be the first client of REMCO post-launch ensuring instant usage of REMCO's blockchain infrastructure. We have existing integrations and process transactions daily for well-known corporates such as Western Union, IDT/Boss Revolution, Transfer-To, and many others.